Traveling in Europe via train is a fun way to hop from one European country to another, or from one city to another city. Today, we are going to talk about how to travel from Warsaw to Krakow with Polish railways PKP Intercity. There are a few train options available to travel between Warsaw and Krakow and we'll do a comparison between the EIP train, TLK train and EIC & IC train to see which one makes the most sense to you in terms of your time, comfort and budget. Warszawa Centralna is the Warsaw Central Train Station and Kraków Główny is the Krakow Train Station. These two stations are well located in the center of the city making it convenient for visitors. The duration of the travel can take at least 2 hours and 20 minutes depending on what type of train you are on. There are EIP train, EIC & IC train and TLK train. It's worth noting that these trains all belong to PKP Intercity. The only differences between all of them are the speed, comfort and of course the cost. How to Book Warsaw < > Krakow Train? Booking can be done in person or online; however, it is recommended that if you have are set on your travel itinerary, booking well in advance online can save you money. Online booking opens 30 days ahead so the sooner you purchase the ticket when the booking window is open the better. It's currently not possible to book via email or on the phone with PKP InterCity. The cost of the ticket currently starts at 42 PLN (~$11 USD). Don't book with Polrail service. It's not affiliate with PKP InterCity and they have service fees on top of the ticket's price. Go to https://www.intercity.pl/en/site/for-passengers/information/journey-planner.html for English version. The website is not very user-friendly. They only allow 2 minutes to make the purchase. I suggest you sign up for an account first, then make the purchase to speed things up once you know which train and time you want. Otherwise, when the allowed purchase time is up, you will have to start all over again. Choose the dates of your travel and do the search. Make sure to check "direct connection only" so that you are not presented with stops that can take up to 4 hours long. You will see a few train options and below we'll compare those options. You can print out the train ticket at home. The EIP trains stand for Express InterCity Premium. Like the name suggests, they are the express premium trains. If you want comfort and the fastest way to travel between Warsaw and Krakow, this is the train you want to book. This fast train service's cost starts at 49 PLN (~$13) depending on the date and time, so book early. The journey takes only 2 hours and 22 minutes. The EIC (Express InterCity Comfortable) & IC (InterCity) Trains are the next down in terms of speed. The journey takes only 2 hours and 36 to 46 minutes. Cost starts at 42 PLN (~$11 USD) depending on the date and time. Next to EIC & IC trains are the TLK (Twoje Linie Kolejowe) trains. TLK trains take longer around 3 hours, but can yield significant savings in terms of ticket's price. 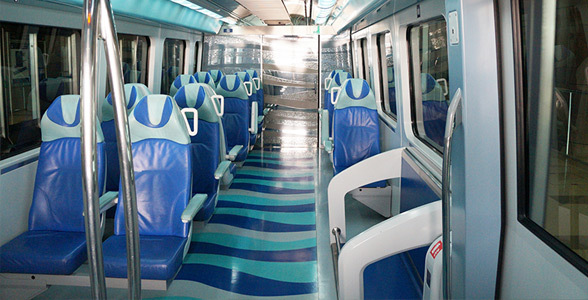 EIC compartments have 6 seats whereas TLK trains have 8 seats. Personally, I'd choose non-compartment during booking so that you don't feel uncomfortable or claustrophobic when you are squeezed in the compartment with other travelers in a compartment. First class on EIC trains are not much different than the second class. Second class carriages between EIC and TLK are pretty much identical although TLK trains are older. First Class on TLK train is more or less the same as second class on EIC trains, but when you are in first class on TLK trains you also get complimentary snack and drink. TLK trains are typically cheaper than EIC trains and therefore the carriages can get crowded. Seats capacity are controlled so everyone has a reserved seat. No one is standing! Unfortunately there's no seat map, and the system automatically selects seat for you based on your preferences during booking. This is not a long journey train, so if comfort and speed mean a lot to you, then go with EIP trains. If you are fine as long as you have a decent comfortable seat on the train and money is the most important, then go with either EIC & IC or TLK trains. You just need to find what date and time that really works for you, some EIP trains are not that expensive if you can plan ahead. Further information on these trains can be found here. Non-affiliate blogger. Obsessed with using points for luxury travel to explore the world. Enjoy finer things in life & good food. This is a great news that was just released by the Minster of Justice and Equality. Over 40,000 visa required nationals will benefit from this change. Under the current system, visa required nationals who live in Ireland need to apply for a re-entry visa in order to leave the country and return. Those nationals also hold a valid IRP (Irish Residence Permit)/GNIB card, but that's not sufficient enough to re-enter Ireland under the current system. Starting May 13, 2019 - over 40,000 visa required nationals will benefit from the new rule. The new rule eliminates the need of the re-entry visa. Visa required nationals that hold a valid IRP/GNIB card will be able to leave and return to Ireland without having to apply and pay for a re-entry visa fee anymore. This change will go into effect on May 13, 2019. Minister Charlie Flanagan spoke about how delighted he was with the elimination of the re-entry system. He said: "I am delighted to announce the abolition of the re-entry visa system. 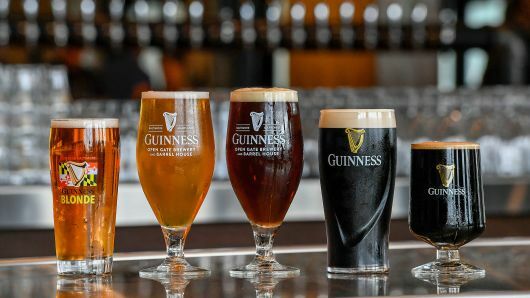 "Visa required nationals will now be able to use their Irish residence permit or GNIB card to prove to airlines and immigration officials that they have a right to travel to Ireland. This will save over 40,000 people annually both time and money. I am committed to improving customer service in the immigration service and today’s decision is the first of a series of improvements which I intend to announce over the coming year." What is an IRP Card? An IRP card stands for Irish Residence Permit. It is the standard EU format for Irish residence permits. The improvement in security in the Irish registration system allows this change to happen without compromising the safety and security of the visa or immigration system. In return, it will save those nationals both time and money. For those nationals that are not issued an IRP/GNIB card will still require to apply for a re-entry visa. Those nationals are minors under 16, intending residents, and diplomats. Re-entry visa application for a minor will be free of charge. Any applications for re-entry visas that have already been submitted to INIS will not be processed and passport will be returned to the applicant in 2 weeks. Moving forward, if you are traveling and return to Ireland before May 13, 2019 you still need to apply for the re-entry visa in person by making an appointment online. If approved, you will be given the re-entry visa in person and visa fee is waived. Sprint WiFi Calling feature is extremely helpful when you are traveling International or outside the U.S. You can make and receive phone calls just like you were in United States as long as you are connected to WiFi abroad. For example, people in the States can just dial your 10 digit numbers and you are able to answer the phone over WiFi abroad. The same thing for you that you can just dial 10 digit numbers of a U.S. person to make a phone call over WiFi abroad. Best of all, with Sprint WiFi Calling, you don't need to have cell service in the country that you are visiting. As long as your Sprint phone is connected to WiFi, you will able to make and receive phone calls. I have travelled to so many countries in the world and have used Sprint WiFi Calling International many times to keep in touch with love ones at home. I never got hit by International roaming calls charges after I returned to the States. However, after my recent trips to Australia and Dubai, I came home and got my bill from Sprint with an unusual charge amount. The bill was higher than my normal bill. I took a look at the details of charges and sure enough there was International roaming calls charges in Australia and Dubai. 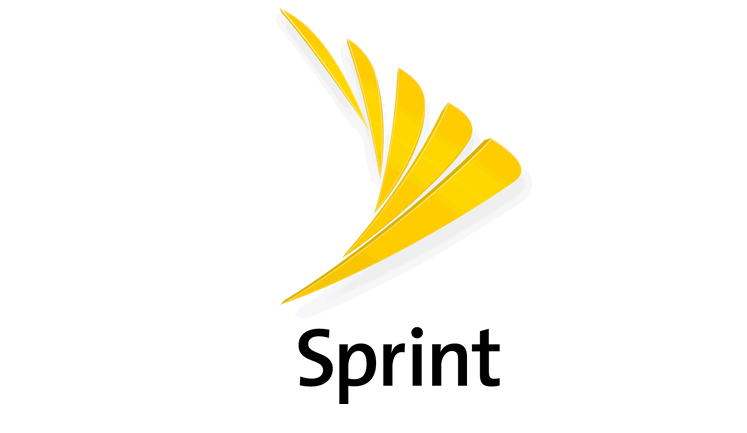 Sprint charges 20 cents per minute. I was in shock but also perplexed about the charges. I was using Sprint to make and receive phone calls ONLY when my Sprint phone was connected to WiFi the entire time I was in those countries. I also confirmed with Sprint customer service in the International department before my trips to make sure my phone was ready to go abroad, WiFi Calling was enabled and everything according to Guide With Sprint International Roaming and Wi-Fi Calling. Sprint WiFi Calling International Is Not Supported In Every Country! Am I able to make calls from international locations with Wi-Fi Calling? Any unsupported countries should be all listed. Sprint Customer service agent at International department should be educated about this to prevent giving wrong information to customers. In the end, Sprint reversed all the International roaming charges because the agent provided me wrong information. It really wasn't the agent's fault per se. I believe that everyone is just trying to do their job there, but they just were not aware of the information. Kudos to Sprint for being understanding and reversing those charges for me. How To Tell If Sprint WiFi Calling International is Supported? I continued doing more research and the way you can tell if Sprint WiFi Calling is working or not is to look at your Sprint phone. Make sure on the top it says "Sprint Wi-Fi" If it does not say that, it means you are not making and receiving phone calls via WiFi, you are actually connected to the country's available cell service and thus you are roaming. See the image below. Dubai International Airport is the main international airport serving Dubai, United Arab Emirates. It's one of the busiest airport in the world and located just 3 miles (5km) away from the city center. Below are the transportation options that are available: Dubai Metro, Dubai Public Bus, Dubai Taxi or Uber and late night arrival options. Dubai Metro is safe, clean and very efficient. Best of all, it's very economical to get from Dubai International Airport into the city. There are two lines that operate this route: Red and Green Line. These two lines don't operate 24 hours and hours vary by day of the week as well. So if you are arriving outside of their operating hours, you will need to explore another option to get from Dubai airport to the city. How to Purchase Dubai Metro Ticket? To travel on Dubai Metro, you will need NOL card or NOL ticket. There are a total of 4 types of NOL card: Silver, Gold, Blue and Red. If you are going to use Metro a lot in Dubai, then choose the Blue card. If you just want to pay as you go, then choose the Red card. It is a paper-based ticket and you can load up 1 trip as you go with the ticket office or the ticket vending machines. The price you load on the Red card will based on the zones you travel. Silver and Gold are premium cards and thus more expensive. All types of NOL card can be purchased either from the ticket vending machines or a live person at the ticket offices that are located in the Airport terminal 1, 2 and 3. The cost of the ticket is really cheap and can range from AED 4 (~$1.09) to AED 8.50 (~$2.31) based on the zones of travel if you load the trip on the Red card. For more information on how to purchase Dubai Metro ticket, where and NOL cards type and price, visit Dubai Metro website. Use Google Map to help you determine what stop you need to get off for your hotel. Dubai Metro is not very extensive, but it can get you close to tourist areas such as the Dubai Mall/Burj Khalifa, Dubai Creek, and Jumeirah Beach Residences (JBR). Is Dubai Metro Safe For Solo Female Traveler? Very much so! Dubai Metro is very safe for everyone. If you are female and worry about your safety in the car, there are females only car available as well. Male travelers, be sure not to get on those cars or you will be fined. You must have a very good compelling reason to go with this method of transportation from the airport to the city. The time the buses take is much longer than Dubai Metro, approximately over 1 and half hour long and possibly require transfers. The cost is about the same with the Metro and you also need to pay with the NOL card/ticket as you cannot pay cash with the bus driver. Bus stops are located at the arrival level in all airport terminal 1, 2 and 3. Operating hours are very much similar to the Dubai Metro above. First of all, Uber is available in Dubai; however, it's not going to be as fast and efficient like Uber services we are used to in the States or other country. You will be waiting quite some time to be picked up. The one single reason I use Uber is the ability to know the cost of the trip before getting in the car which is different than the traditional taxi. However, Dubai taxi is very reliable. The fare is government regulated and thus you won't be tricked or ripped off. 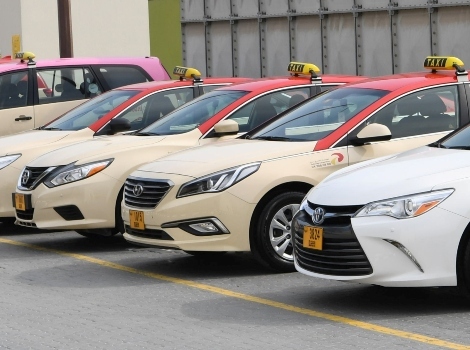 Dubai taxi fare is also very affordable. After clearing immigration and picking up your bags, just follow the taxi sign and you will be in the taxi queues. Make sure to get on the cream color taxi as they are the most affordable ones. This is the most convenient way to get from the airport to your hotel door to door service. Is Dubai Taxi Safe for Solo Female Traveler? Absolutely! Look for the pink color taxi. Those cars are dedicated for female passengers only and the driver is also female. There's no need to worry about it! If you are arriving late night into Dubai, the best option is to simply take the above mentioned taxi option from the airport to your hotel. Dubai International Airport is busy all the time throughout the day and night, there are plenty of late night arrivals and departures so you are not alone. Dubai taxi is totally safe, affordable, convenient, and hassles free. The Big Bus Tours Dubai is one of the safest and best ways to check off your must-do and must-see attractions list in Dubai. You can enjoy the panoramic views of Dubai's amazing skyscrapers including the world's tallest building in the world - The Burj Kalifa, beautiful sandy beaches and historical places along with the traditional Dhow cruise on Dubai Creek. In this post, we'll talk about Dubai Big Bus tour price, routes, timings and map along with our recommendation on which ticket to get. If view from mobile phone/tablet, please make sure your device is in horizontal display view. There are three color routes: City Tour (Red Route), Marina Tour (Blue Route) and Beach Tour (Green Route). Dubai City Tour Bus route has 10 stops: The Dubai Mall (The Burj Kalifa), City Walk, Wafi, Burjuman, Dubai Museum, Old Souk, Heritage Village, Gold Souk/Spice Souk (Dhow Cruise), Riviera, Diera City Center. If you don't wish to hop off, the entire tour takes around 2 hours to complete. Marina Tour bus route has 10 stops: Mall of the Emirates, Marina Walk, Marina Mall, The Beach (The Walk at Jumeirah Beach Residences), Marina Promenade, Bayside, Tallest Block, Media City, The Pointe, Atlantis the Palm. If you don't wish to hop off, the entire tour takes around 1 hours and 30 minutes to complete. Beach Tour bus route has 5 stops: The Dubai Mall (The Burj Kalifa), Jumeirah Public Beach, Burj Al Arab, Souk Madinat, Mall of the Emirates. If you don't wish to hop off, the entire tour takes around 1 hour to complete. Dubai's popular attractions are in bold and you can experience all these Dubai landmarks with the Big Bus Tour! You can switch between buses and each bus runs every 20 minutes subject to traffic condition. So say if you need to go from Marina Promenade to Dubai Mall, you will have to switch from Blue route bus to the Red route bus at the Mall of the Emirates, so on and so forth. The process is really easy and don't worry, there's always a Big Bus agent at each stop that is friendly and ready to help you out. Which Big Bus Tour Ticket? Which Dubai Big Bus ticket to purchase, it's an individual thing as everyone's traveling style is very much different. If you just want to sit and enjoy the views from the open top bus without getting off the bus other than to switch the bus, then getting the one day hop on and hop off ticket is perfect for that. It'll keep you occupied all day long because there are total three different routes and you'll need to switch buses. If you want to see the highlights of Dubai, I'd recommend that you get the 2 days hop on and hop off ticket. The reality is, you can't hit all of the attractions in 2 days as there are just so many things to see. You have to decide which stop or sight you want to see and let go some as you just don't have enough time to see all the sights on all the three routes. 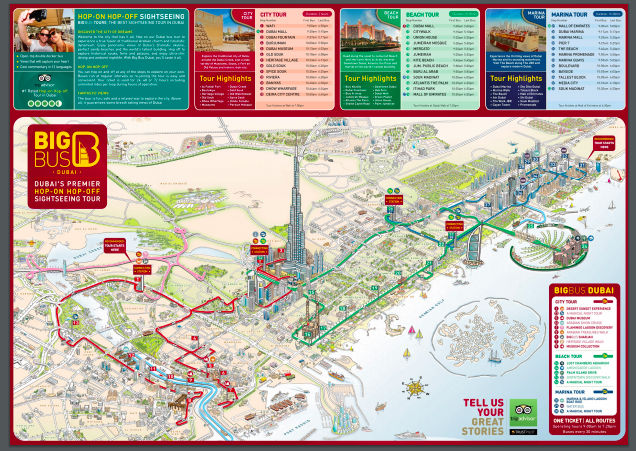 The 5 days ticket obviously is the most expensive but it'll give you plenty of time to enjoy all Dubai sights on the three routes without rushing. You can enjoy the attractions at your own pace and time. However, that also depends on how many days you are visiting Dubai too. The choice is yours, but my recommendation is to consider the 2 days ticket. Whichever ticket you choose, you will have an amazing time with the Big Bus tours Dubai. It is a very clean, safe and fun way to check out what Dubai has to offer. You can either choose to buy the ticket on the street or online in advance. Purchasing tickets online will give you 20% off the regular price. If you enjoyed reading this post, sign up to receive free blog posts on travels, tips & tricks via email here or like our Facebook Page. We greatly appreciate your support. Hello everyone, I am a Travelholic! That's right, and my hobby is collecting magnets all around the world, mainly places that I have travelled to. I very much enjoy traveling and as we all know, traveling can be really expensive. Thanks to airline miles and hotel points, I have been fortunate to travel far with little money. Planning a trip isn't quite easy at all, that's why I am not hoping for a perfect vacation, but rather a good satisfying getaway with wonderful memories that I will cherish and one magnet at a time to be put on my magnet board - Travel of Fame.